A fitting location for a meeting with Northern Irish ‘atmosfolk’ duo Saint Sister would be a hidden grove, deep in the heart of an enchanted forest. However, the GoldenPlec team settled for a quiet corner of an old Dublin pub, where chat was occasionally interrupted by the singsong of an overexcited blackbird, perched above the chimney. 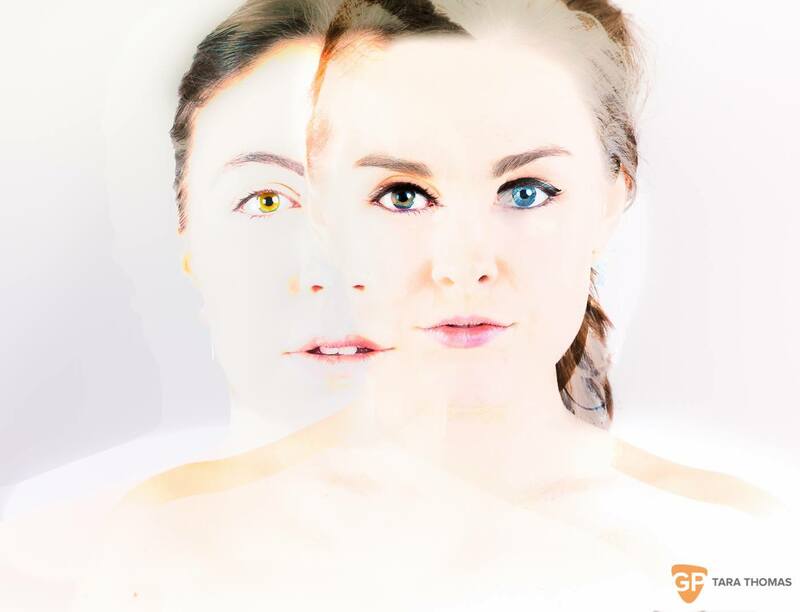 Morgan McIntyre and Gemma Doherty, formed Saint Sister in November 2014. Since then, the gifted storytellers have seduced listeners with carefully crafted lyrics played out through their unique sound - a combination of '60s folk, Celtic harp, electronic pop and hauntingly beautiful harmonies. The hard-working duo released their first EP 'Madrid' (recorded with Hozier bassist Alex Ryan) in November 2015 and supported the likes of O Emperor, SPIES, Wyvern Lingo, San Fermin and Will Butler of Arcade Fire on tour - and performed at Other Voices in Dingle. “We got to play three contrasting gigs in Dingle. We had one in the Other Room when Storm Desmond was raging. The little Other Voices hearts were falling down around us as we played but people still turned out despite the weather. Straight after that we did this small gig in Foxy John’s pub beside a fire with Jim Carroll… just the harp and two vocals. Then we played at a small church, it was so different to anything we’d done before but it was really special,” says Morgan. Two years on from a chance meeting at Trinity College, the girls are well on the way to realising their dreams. “The first time we properly shook hands was in a battle of the bands competition. I was like ‘Ooh, there’s a harpist!’” says Morgan of her first encounter with Gemma. The summer they left college, the pair sang with Trinity Orchestra at Electric Picnic, and it was here that the seeds of their musical partnership were sewn. “We were stuck in the post-college blues. You start to contemplate everything. You start to think ‘Where am I going? What am I doing with my life?’” says Gemma of the impetus to focus their full attention on music. “It’s just a really strange time in life and Morgan got in touch with me after Electric Picnic saying she’d like to work with me. Neither of us knew what we were going to do but it just kind of worked from the start. It clicked. 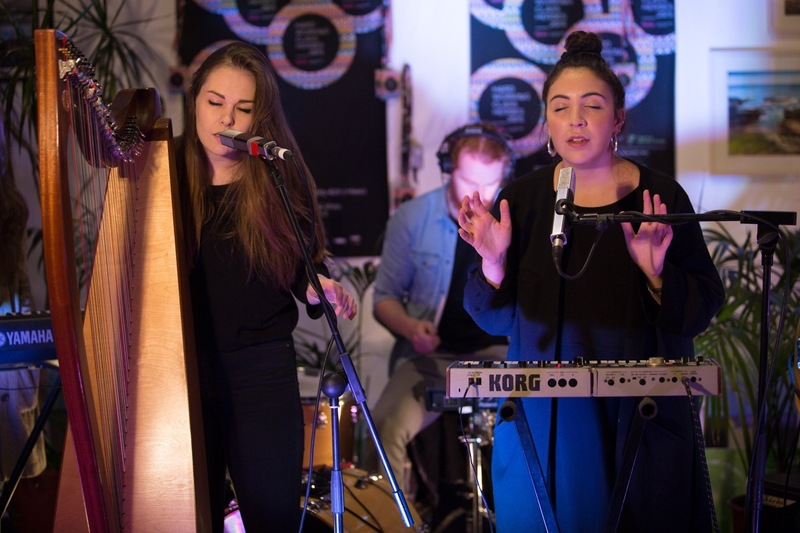 As Saint Sister took off, the band relied on the close-knit community of Irish musicians. They supported SPIES on tour, as well as Wyvern Lingo and garnered a massive following, which is increasing in numbers by the day. “Everyone helps each other out. If one person or band succeeds it gives everyone else a stronger chance too. We can all go forward together. It’s a really lovely scene,” says Gemma. The pair are now taking everything as it comes, slowly building upon each success to carve a name for Saint Sister in the music scene. “The only things we can control are writing songs and performing, putting on a good live show. We set high expectations for ourselves but we’ve achieved what we’ve wanted to achieve so far. When you get something like Other Voices you think to yourself: ‘There’s a reason why I’m doing this.’ We’re going to keep going. It’s really good fun, as well as being rewarding,” says Gemma. The girls have a deep-rooted passion in music. Derry native Gemma, who can craft harp notes that trickle and tumble like eddies in a stream, says her love of the Celtic instrument came about at a very early age, by chance. Morgan’s love of music blossomed through a childhood spent dreaming up songs, forcing family members to listen to poems she’d created on long car journeys. Her family assumed she’d take up a career in creative writing due to her love of words but in secondary school, the Belfast girl took up singing lessons and worked on building up piano and guitar skills to accompany her lyrics. “I’m much more concerned with melodies and lyrical content. Gemma brings so much to the table in terms of instrumentation." Achingly, beautiful and relatable lyrics is something that Saint Sister is developing a reputation for. Stories of wounded reflection, tales of loneliness, words that float from haunting voices and cast a shimmering glow upon the melancholic moods that most of us experience at some point or another. Fringing our dark moments with flashes of luminosity in a powerful evocation of empathy and scarred hope. “Most of our songs deal with the lack of love and the feelings connected to that experience,” says Morgan. 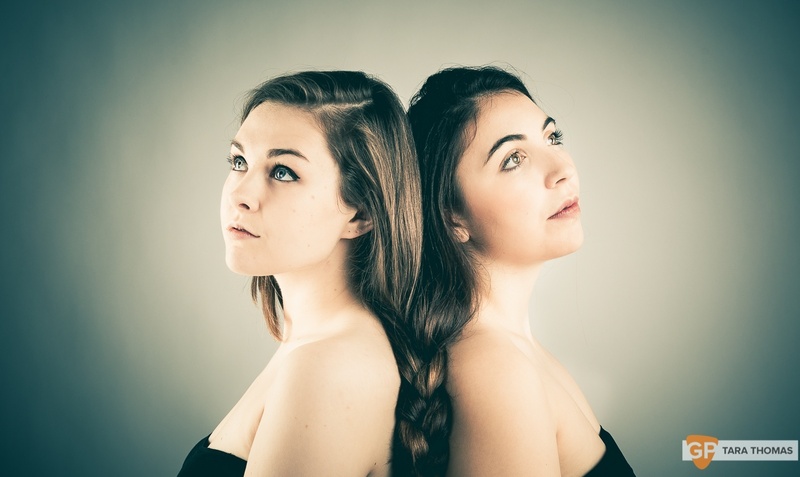 Honesty is also really important to Saint Sister and they strive to create songs with integrity, looking to connect their words with experiences and emotions that they understand. “It can be emotions stirred from seeing a painting or even someone you saw on the street - the feelings just have to be real,” both girls agree. 2016 looks to bring a wealth of new experiences and emotions for Saint Sister as they take their music to a global audience, performing at Festival A Nous Fireworks in Paris, SXSW in Austin, Texas and The Great Escape in Brighton. “It’s exciting but we’ll take each day as it comes,” says Morgan. “I used to suffer from really bad stage fright. Performing was something I found really difficult but it eases with each gig. It’s nice to enter the new year knowing that I’ve left some of that behind,” she says. The blackbird disappears and the interview draws to a close as the girls reflect on the previous year.